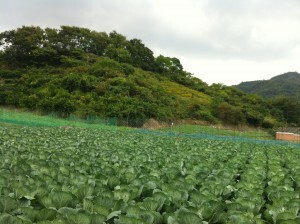 This sprawling cabbage patch is at the bottom of Mt. Shirataki. Even cabbages can be a feast for the eyes while you are on a trail. Nearby stands Shirataki Sanso, which once belonged to a foreign missionary as the residence and now is a restaurant/lodge. The lunch here is a bliss.